Each infantry company is slated to receive three vehicles, though crews don’t expect to operate together except on rare occasions. The vehicles carry crews of three, and are equipped with a 105 mm main gun and a state-of-the-art fire control system. The MGS also has an onboard coaxial machine gun that’s fire controlled. The 105 mm is capable of firing four types of rounds: SABOT, a depleted-uranium armor-piercing round; HEAT, high-explosive anti-tank; HEP, high-explosive plastic; and a canister round. The rounds are loaded using a hydraulic auto-loader in the rear of the vehicle. 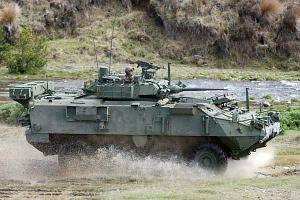 The HEP and canister rounds give Stryker units new capabilities, especially in urban areas. The HEP can blow holes in reinforced concrete walls, but unlike the rounds from an Abrams, won’t continue through the target and into surrounding buildings. The canister provides as effective anti-personnel capability. Canister? Holy crap, I haven’t heard that term since I toured Gettysburg. I didn’t know it was still in the arsenal. Makes sense though. Canister, aka grapeshot? Too much trouble for too few kills. HOWEVER: Beehive rounds are much more effective against enemy personel, but maybe the idea of shredding folks into hamburger with thousands of 2-inch flachettes (metal darts) isn’t politically correct. Beehive is effective but is a bit overrated (personnal experience). The cannister doesn’t have as many projectiles but they also have potential for damaging material and remain lethal even after ricocheting a couple of times (unlike the ten penny nails in beehive, a third of which go spinning off who knows where). Think of the cannister used by the British field guns during WWI. Now add potential for electronic fusing coupled with a laser range finder to give an optimum pattern on target with the ability to penetrate light or even medium cover. Not starting old arguments concerning the stryker (I’m happy for the troops to have any functioning new system) I would have preferred a different main gun. I’m assuming the 105mm was selected for cost saving reasons but I’m not happy with the basic load quantiety. A unit with these guns gets decisevly engaged and they’ll go through that ammo load way to quick. Years ago some great work was done with high velocity, rapid fire 75’s that would have fitted the vehicle better. Heck imagine a tri barrel GU-8, triple drum selectable feed system loaded with HE, cannister and penetraters. Even if an armor target was to tough for the penetrators I doubt it would be effective after all the optics were stripped by the tungsten 00’s from a long burst of cannister rounds. I’m shutting up now. I think the choice to go for the 105 is because there’s alot of M68A1 guns lying (figuratively) around. I did a little digging, and it looks like the 105 mm ‘canister’ round is based off of this 120mm round. http://www.globalsecurity.org/military/systems/munitions/m1028.htm Looks like a turkey load on steroids. Hmm thanks for the link jaymaster, hopefully they’re going with a fused version. That would allow extended engagement ranges (once again think of the time fused British field guns of WWI). If it’s non-fused it would be of very limited use and mostly a waste of basic load space if even carried. These guns should be amongst and firing in support of infantry so a non fused cannister round would not have a lot of uses without endangering friendlies. Yes Gab I agree. Probably economics driven since the tubes and the ammo were laying around. I can see trying to save cash but I still would have felt more comfortable with a different maingun in this role. I wonder sometimes how many young grunts have died because of the bean counters……? Oh well I think I’ll just give up trying to follow their logic and simply amble over to the liquor cabinet. Remember, they’ve done silly stuff like this before. After they screwed up the MBT 74’s developement they tried to get some payback on investment. We have that to thank for the M551 and the unlamented (and currently sitting off the shores of Florida as coral reef seeding material) M60A2 with their 152MM gun/launchers. At least there’s something now. I lament that it could have been far better for the time and money invested. I’m shutting up and getting inebriated now, ‘night all. Correction to my rant. Should have read M551 which influenced the MBT70… my memory retention is terrible these days. A friend of mine recently returning from a 1 year tour of duty, informed me that his Tank fired exactly 11 main gun rounds in a full year. Many of which were used to take out buildings or walls. Concerns about this round taking up valuable ammo space is unfounded. The main gun is rarely used in the current battlefield and often tank crews are dismounted. So an anti personel round of this sort is very effective despite its short comings. He said this round was very effective and like it alot. Additionally,prolonged engagements are not really a valid concern with regards to ammo capacity. Air Support is never far away (less than 15 minutes) and Gunships or Aircraft make short work of any enemy vehicle.